The right choice of food can help you to control your diabetes. People that have diabetes are aware of the fact that when it comes to diabetes the first rule is to avoid food high in sugar. Some foods are considered as healthy, but in fact that they contain fats and sugar that you might not know about. You should also be very cautious about carbs and fats, because they can also contribute to high levels of blood sugar! The hamburger is rich in saturated fat that can significantly increase your cholesterol. However, before you decide to eliminate this food from your diet, you should know that you can still eat it just make sure to check the nutritional information. The American Heart Association claims that the saturated fat should be limited to 7% of the total calories on a daily basis. This Mexican food is not recommended for people with diabetes. Keep in mind that nachos contain a lot of calories regardless of the way you eat it (as a meal or as an appetizer). To be more specific, Chili’s Classic Nachos has exactly 830 calories, 59 grams of fat, and 39 grams of carbs. In other words, nachos are out of the menu! Pizza is definitely one of the favorite foods to almost anyone. It is tasty and easy to get. It doesn’t matter if it is frozen pizza or commercially prepared, both of them have a high content of calories. So, instead of eating a bunch of calories, you can always prepare pizza in your own home, choosing better toppings. It is recommended to prepare one with fresh veggies and herbs. Individuals with type 2 diabetes are highly recommended to avoid dried fruit. Dried fruits have a high content of fiber and nutrients and this is the reason why many people consider this fruit as a healthy alternative. The truth is that the fruit undergoes dehydration and there is a concentration of natural sugar. Dried fruit is a good replacement for cookies, but regardless of this, it will still increase your blood sugar. So, if you want something healthy and sweet at the same time, you can have strawberries or grapefruit. Diabetics need to take care of the amount of sugar and carbs they consume a day. Foods prepared with white flour such as rice, bread, and pasta are the same as sugar for the digestive system while the carbs interfere with the glucose levels in the body. Actually, if you prefer carbs, you can consume whole grains like oatmeal and barley. Also, instead of white rice, you can always use brown. Full-fat dairy products contain saturated fats and can increase the bad cholesterol (LDL) as well as the risk of heart disease. People with diabetes are recommended to avoid products like cream, full-fat yogurt, ice-cream, and cream cheese. It is scientifically shown that saturated fat increase the resistance to insulin, so make sure to use low-fat or fat-free dairy products! These days, flavored water has become a popular trend that successfully replaced soda. Actually, flavored water has no hidden sugar or carbs. Flavored water has a lower sugar content compared to soda. However, if you drink the entire bottle, it will have the same effect! Chinese food is high in fat, high in sodium, high in carbs and has a lot of calories. It will keep your blood sugar high. Make sure to avoid dishes that have sugary sauce, orange chicken, and sweet and sour dishes. Fatty meats can increase your cholesterol, cause inflammation and increase the risk of heart disease. You should not forget that they are high in saturated fats. If you want to consume proteins, always make the healthy choice. You can eat fish, pork tenderloin, chicken, lean beef, and skinless turkey. Doughnuts, muffins, pastries, and cinnamon rolls are high in sugar, carbs, and fat and they are all made from white flour. They are high in sodium and contain trans fats. But, if you really want them, you can choose fat-free or sugar-free or you can prepare them by your own using healthy ingredients. We all know that fried foods are not healthy for us. Make sure to avoid French fries, fried chicken, potato chips, and other deep fried foods. A lot of oil is used while preparing these foods, meaning that you will consume more calories. Moreover, restaurants use hydrogenated oils with high trans fats. People with diabetes should always take care of the amount of trans fats. You should always consume fruits because they have fiber, vitamins, and carbs. 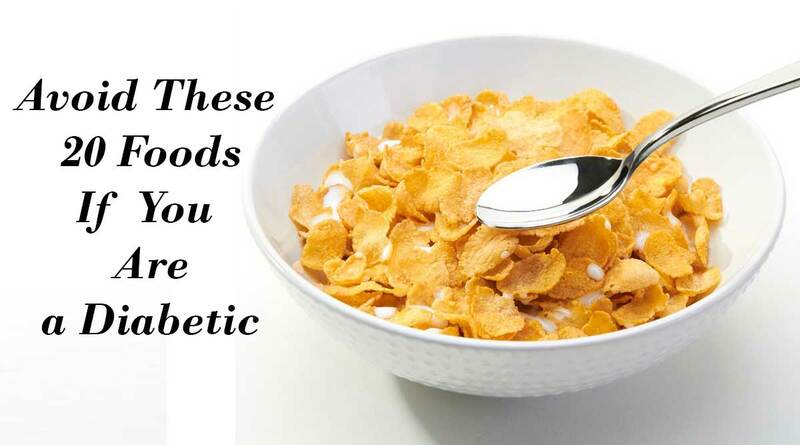 However, you should consume them in moderation because they can increase the level of blood sugar. Stone fruits, melons, and bananas have high sugar content and can affect your level of blood sugar. Blended coffees taste rich because of the toppings (sugar and fat), whipped cream, syrup, sugar, etc. If you want to consume coffee, make sure to choose coffee that is sugar-free and use low-fat milk. Processed meat has rich content of sodium that can increase the risk of heart attack or stroke if you have type 2 diabetes. Also, you should consume meats that a low in sodium and avoid toppings, or use the ones that don’t have a lot of carbs and fats. Instead, make sure to use cucumbers, spinach, and mustard for your sandwiches. Nowadays, smoothies have become a popular trend. Even though they are considered as healthy, you should keep in mind that they contain added sugar and are served in extremely-large portions. So, you should always prepare your homemade smoothie in your own blender. People with diabetes are recommended to consult a doctor about the amount of alcohol they are allowed to consume. Alcohol in fact interferes with your blood sugar, so you should drink it in moderation, no more than one or two drinks. Per one serving: 1 ½ ounces of liquor, 5 ounces of wine and 12 ounces of beer. Fruits have fiber and healthy carbs and they are great for diabetics, but this does not mean that fruit juices are healthy too. It is more nutritious than soda and sugary drinks, but contains a lot of concentrated sugar. So, instead of fruit juice, we highly recommend you to consume seltzer with natural flavor. By sugary foods we mean candy, soda, and desserts. All foods that we mentioned before have a high amount of sugar. The sugary foods have low nutritional value and are low-quality carbohydrates and they can increase your blood sugar. So instead of cookies or soda, make sure to choose fresh fruit. Most cereals are coated with sugar so they can obtain that sweeter taste. There are also cereals that contain added sugar. So, it is very important to always read the label and avoid the ones with dried fruit! The energy or sports bars are not unhealthy, but diabetics are recommended to avoid them. Sports bars have high content of carbs and sugar. Even though they are the main sources for supplying your body with energy, you may consume too much with the sports bars. We recommend you to choose bars that have minimum fats and sugar and that have a balance of protein and carbs. Having diabetes does not mean that you can’t lead a normal life. Just, make a difference between the good and the bad. Eating a healthy and proper diet is the best way to manage your blood sugar.